A few weeks ago it was pointed out to me that I hadn’t done much baking for the office. I also realised I hadn’t bought anything back from holiday with me. So I decided to make some cupcakes to take into the office. 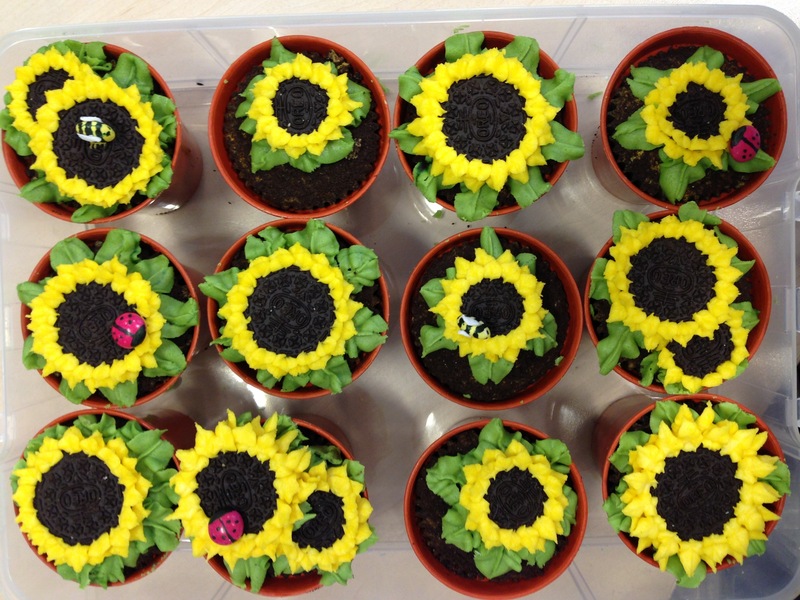 Since the weather had been pretty rubbish, I thought some sunflower cupcakes might help bring the sun out… and they did! Maybe only for a week but it was better than more rain. I got the idea for these from my Hello Cupcake! book. There were several flower/summery ideas but these ones jumped out at me so I decided to give them a go. I also had a pack of Oreos in the cupboard. I needed mini ones too to make the smaller sunflowers which I didn’t have, but I got round this by using a small circle cutter to cut out some mini ones. I also think you’re meant to use whole Oreos but since there weren’t enough in one packet, I split each one in half to double the number. I baked a batch of vanilla cupcakes, spread some vanilla buttercream on top and then dipped each one into crushed Oreos to make them look like they were full of soil. I coloured half a batch of vanilla buttercream yellow and the other half green. I placed the green buttercream into a piping bag with a leaf nozzle attached (I used a Wilton no. 70). Using a cocktail stick, I drew circles on each one marking where the Oreos were going to be. I then piped leaves round each circle which I’d marked and then placed the Oreos on top. I placed the yellow buttercream into a piping bag with a petal nozzle attached (I used a Wilton no. 352). 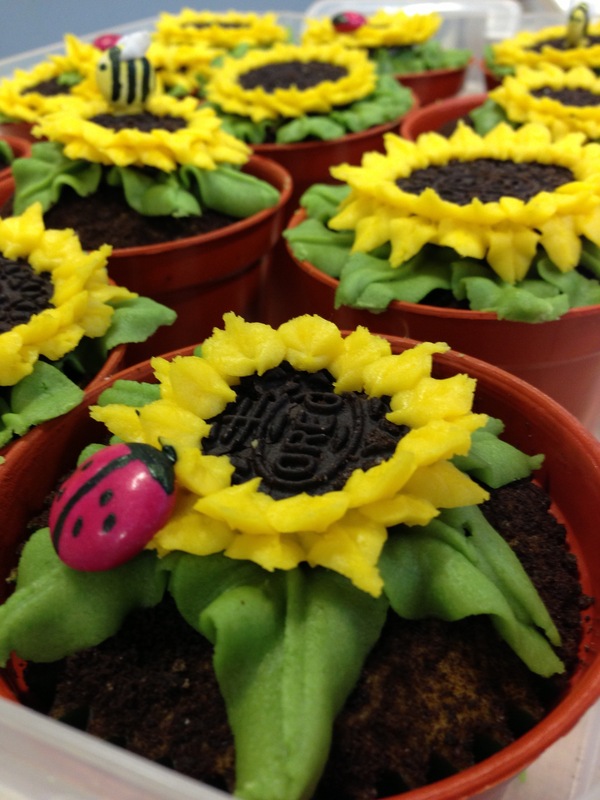 I piped petals round each Oreo – I did 2 layers, one right on the edge and then second just inside it. 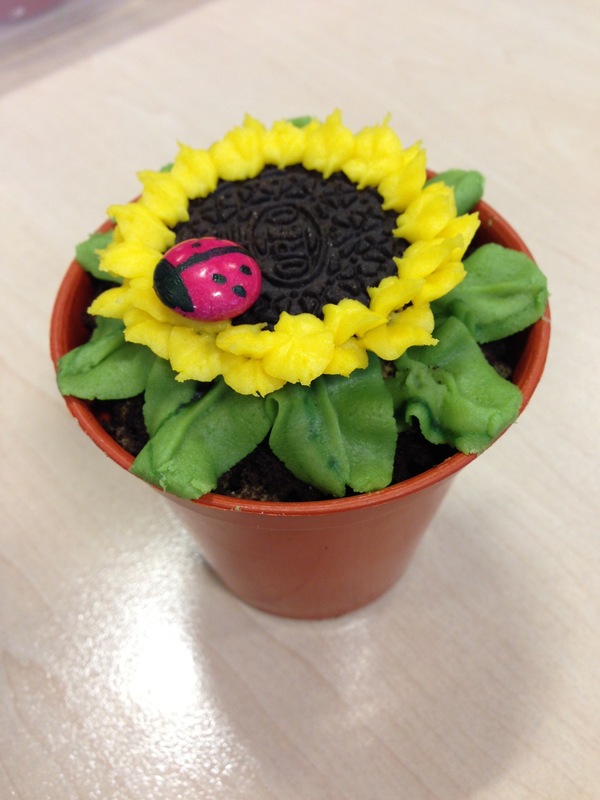 To add the finishing touch, I took a few red and yellow Smarties, and using a paintbrush and some black food colouring I painted dots and stripes to turn them into ladybirds and bees (I used a tiny amount of white fondant icing for the wings on the bees).